Hola Amigos, Juego Bingo cordially invites the Spanish speaking community to come play, specifically created just for you in mind. As hot as chili red peppers, and cool as a tall margarita, the site has all your bingo needs with a touch of Latino flair. Although Juego Bingo has Spanish influence, players from around the world can participate with languages that span across the globe with just a click of a button. In case you are wondering what “juego” means, pure and simple interpreted in any communication it is “play”. It doesn’t get more appropriate than that with a vast selection of gaming options. As part of the Amigo Bingo group and under the umbrella of Bingo Affiliates winning numerous awards it speaks volumes in conversation. The web design is nicely laid out, bridging the gap across the world where every player feels right at home. Players from the US are warmly welcomed to join and be a part of this exciting league of Bingo roomies. Fully licensed and registered in Panama, an assurance of an exceptionally operated online site. Parlay software powers the platform with products for Bingo and Casino games. 75 ball bingo was brought to popularity in the US and is a world-wide sensation that has spread across the planet. 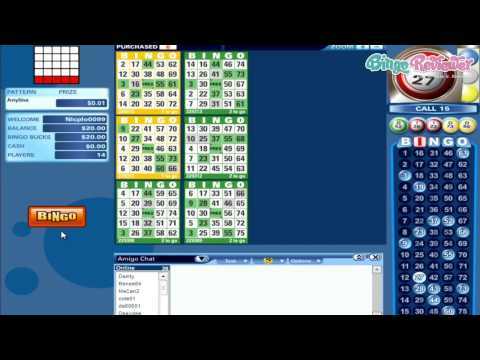 Each game is uniquely different, avoiding the bored factor with an enormous selection of bingo patterns. Coverall patterns are where generally the biggest cash prizes are offered with Progressive Jackpots that continuously climb until a winner is declared. The Casino features a wide range of Slots for those gamblers that have the yearning to spin. Features include all the Vegas style action including Free Spins, Bonus Rounds and coin values that start as low as a penny per line. Traditional Slots have the classic 3 reels with Video Slots offering more lines and bigger chances to win. A large part of the promotions are appropriately centered on Bingo. Serious Jackpots can be won with exclusive offers giving away big cash prizes. These special offers continuously change creating an inspiring gaming experience of sheer excitement an entertainment. Free Tournaments are a lucrative way to earn prizes without spending a single penny of your own money. Play every Wednesday and compete with your bingo roomies in the Yellow room between 10pm and midnight. The Benefits program is where loyalty pays offering Cash-back on a monthly basis based on your deposits and no pending withdrawals. The Spanish community and commemorate in one spot while players from all over the world can join in on the action. It is an ideal site for the US player considering the limited options where they are accepted. We rate Juego Bingo with 2 Pink Hearts. The first thing I noticed about this site was their welcome bonus. You really can’t go wrong with what they’re giving away. All new players receive a whopping offer of $20 free just for signing up. It’s a great way to start off your experience at the site because you can start playing for nothing out of your own pocket. Another great thing about juego bingo is the amount of players they accept from different countries. They are big on community and part of the way they intend to create a great online gaming family is by accepting a wide range of players. They offer a little bit of everything when it comes to gaming. They have one type of bingo and tons of patterns to choose from. In addition to bingo, they also offer a decent amount of casino-style games. The promotions are very nice as well. I found this site to be really fun, but I was a little disappointed with their bingo selection. They only offer 75 ball here which I could not believe. Prior to becoming a member it is almost impossible to even find out that much. I was scoping out the site and I could not find anywhere what kind of bingo they offered. One thing I will say, is that they sure offer a wide variety of bingo patterns to choose from. The patterns you can choose from are virtually endless. Aside from the bingo, they also offer a list of casino games. I think I may actually like playing those better here. Don’t get me wrong, despite their small bingo selection, I do enjoy playing it. I simply find the jackpots for the casino games to be a bit better. The promotions here are really great. My favorite is the nightly giveaway of $15,000! I've got mixed feelings about this site, first of all, I am not that good with Spanish, and you can't get the interface in English. Secondly, they have a really impressive list of starting bonuses, like a $20 No Deposit Bonus at the sign up. That's just the beginning, since they also have 600% bonus for the first and another 400% bonus for the second deposit. After that, you have a 300% reload bonus, and that really sounds great. The site looks decent, but not very modern or attractive. Now, for the part I don't really like. It's a bingo site and I expect to play more than one variant. I can't find a good explanation even for sites that have only 75 and 90 ball games, but this one has only 75 ball bingo, and that, at least for me, just isn't enough. Will stick around to spend the bonuses, but will look for my bingo elsewhere.